I just finished the book 168 Hours: You Have More Time Than You Think by Laura Vanderkam and I would like to share with you what I learned from it. We all have 168 hours in each and every week of our life. Question is: How do we spend this time? Usually big part is spent sleeping, working and taking care of people and things in our lives. And we often feel we don’t have enough time for ourselves, our hobbies and passions. But there is always potential to optimize our weeks, and reschedule them to be able to spend time (or more time) on things that matter to us or with people who we love. 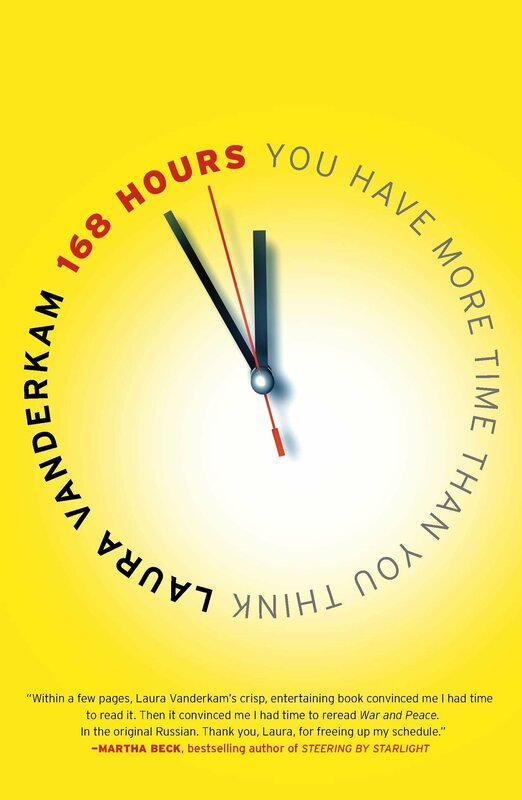 The book is based on stories of dozens of people, Vanderkam’s personal story and statistical information on current and historical time use. Throughout the book Vanderkam introduces us to outstanding people who are successful at their work, spend quality time with their families and fulfill their passions. The good news is, we all can revamp our time schedules and have beautifully balanced weeks and life where there is time for everything that matters to us. It’s difficult to change or improve anything if you don’t have a starting point. That is one of the reasons why you should keep a time log. Laura Vanderkam recommends to write down every activity you do during at least one week (168 hours). We humans are not good at estimating the time spent on any activity. We tend to underestimate the time spent on things we like to do more of, such as sleeping or spending quality time with our family and friends and we tent to overestimate the time spent on things we don’t enjoy doing, such as working or cleaning the house. When you are finished with your time log go through it and put the hours together. How much time do you spend working, commuting, shopping, cooking, cleaning, taking care of your family and taking care of yourself, doing your hobbies, exercising, sleeping etc.? Keeping the log and its analysis will give you a better insight into how you really spend your hours and that is the key to optimizing it. Next step is to make a list of your dreams. The things you would like to spend more time on or the things you would like to try, learn or accomplish. It can be anything as simple as going on a date with your significant other twice a month to anything as huge as earning a PhD. degree. Make a list of as many dreams as you can and identify those that you can and want to include into your busy life right now. You may not be able to move to Italy tomorrow but from tomorrow morning you can start to learn Italian from audio lessons on your way to work. Do you know what core competencies are and what are yours? As Laura Vanderkam writes it in her book core competencies are “the things you do best and that others cannot do nearly as well”. Don’t think only about your competencies at work but also your competencies as a parent, friend, sister or member of a community. Every one of us excels at something. But no one excels at everything. Realizing what you are really good at is not only confidence boost but it will help you to optimize your life to do more of these things. When you do what you are good at, you love it. And when you love what you do you are happier, healthier and more fulfilled. This holds true in work and also in personal and family life. Find your core competencies and find the ways how to spend more time doing them, in work and at home. Your to-do list will grow infinitely if you let it. When you know what you do best and what you would like to do more of, you also realize what you would like to do less of. Is it possible to spend less time on these tasks and chores to free up your schedule for more fulfilling activities? At work there are unnecessary meetings or conference calls that should have been an email or inefficient processes and tasks that add no real value to your product or service. Revise your work assignments and responsibilities. Find out if they add value to the company, if they are aligned with your core competencies and find the ways how to optimize them. Any reasonable boss would like to hear your suggestions. Many of the tasks can be minimized or outsourced to people who will do them better and faster. On the home front there are also activities that have to be done but may be done by someone other than you. You can hire people or subscribe to services that will do your laundry, cleaning, grocery shopping or cooking. All the things you detest can be done by someone who will be happy to do them. You may not have an hour a day for reading a book but you may have 10 minutes here and there. You can read a book while commuting, during your lunch break or while you wait for someone. Or you can listen to audio books or language lessons while driving or biking. Instead of on Facebook spend your 10 minutes productively. You can organize some small area in your home or clean vegetables you will need later for dinner. You can call a friend, write a thank you note or letter, brainstorm Christmas presents ideas or meditate. All these things are small enough to fit into your otherwise busy schedule but big enough to have impact on your life enjoyment. I found many thought provoking ideas and suggestions, inspirational real life examples and encouragements in 168 hours. Not every part of the book or every suggestion is relevant for me, but there are definitely parts that made me thinking and rethinking how I spend my time and which elements of my life can be optimizes. And it also made me realize I have enough time to do anything I want. It only needs to be my priority to do it. Next I plan to dive into Laura Vanderkam’s book I know how she does it for more stories of successful women who understand that you don’t have to choose between your career, family, and passions. You can have it all and still not lose you mental health. And these woman not only understand it, they live by it and are living examples of how it can be done. Laura Vanderkam is an author, writer, and speaker. She talks and writes about time management, life, career and family. She published several non-fiction books filled with stories of real people. These books will not only make you wonder how these people are able to manage their time so wisely and balance all aspects of their life but also provide actionable tips how to do the same in your life. You can follow her work and connect with her on her blog, Twitter or Facebook.